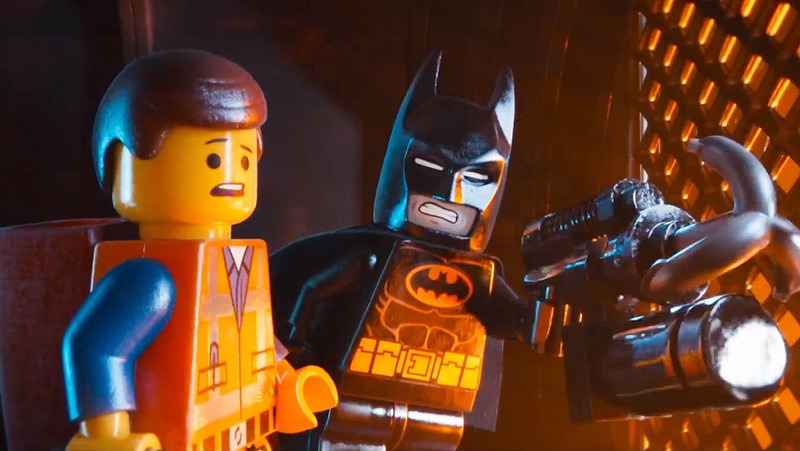 The LEGO movies and video games have been on a winning streak for years. Their playset-based movies have delighted kids, while their Star Wars, Batman, and Lord of the Rings series of games have been popular with both children and adults alike. It would be easy to cry foul that this movie is simply a two-hour commercial in the style of Transformers 1, 2, 3, and soon 4. There are certainly LEGO movies and games that are strictly that. However, The LEGO Movie is that angle's antithesis. Phil Lord and Chris Miller got my "shut up and take my money" vote as soon as I saw Cloudy with a Chance of Meatballs—which is, to this day, one of the most entertaining movies I have ever seen (over and over again). With rave reviews and a projected $60 million opening weekend, The LEGO Movie got almost everything right, from casting to story to marketing. The film "grapples" with danger!... It's a bat pun. The first 20 minutes of The LEGO Movie are a very direct commentary on our lives today. The people living in the LEGO city of Bricksburg are cultural zombies, culled into submission by overlords who control the media. Everyone follows the rules and ends up repeating the same day over and over again. Everything is as generic as can be but JUST entertaining enough to keep everyone subdued, in line, and not asking questions. Everyone in the city seems content, especially our hero, Emmet Brickowski (Chris Pratt). He is so content that he is excited by every day of his humdrum life (like a kid getting to be an adult for a day, but every day). The story rockets forward once two McGuffins are introduced: a prophecy and its accompanying special LEGO piece with no holes or points, "The Piece of Resistance." From there, Emmet meets Wyldstyle (Elizabeth Banks) and questions her name just like I would. Together, they then find the ancient Vitruvius (Morgan Freeman), who we first met in the film's cold open, where he battles President Business (Will Ferrell) and sets up the story's prophecy. The movie holds its own before we even get to any guest stars. The action, the animation, and the humor blend together really well. I can certainly tell you this... when Batman showed up, I was genuinely surprised. He's in every commercial for the movie! And I forgot he was in it! The already fast-paced story kicks up a notch from there and makes room for even more guest appearances (my favorite being Michelangelo and Michelangelo... you'll see). The movie slows down for relationship and character development, but that development often occurs mid-action sequence to keep things moving forward. It's an impressive feat how much got crammed in without overwhelming the viewer's brain. I actually owned this one as a kid. The voice acting is spot-on throughout. You can tell that the actors were told to just go for it. It's fun not only to have Liam Neeson play it up, but to also watch as Channing Tatum, Jonah Hill, and a few others (who I won't spoil for you) appear in bit parts. This made the movie a Hollywood spectacle without feeling like a Danny Ocean movie. As mentioned here, the sequel has already been greenlit, and these days sequels are outperforming the originals. I look forward to part two. However, it is not being written by Lord and Miller... so jury's out on whether or not it can be as good as this one. After all, Cloudy with a Chance of Meatballs 2 is on my "do not watch" list as it paled in comparison to the original. Have you seen this "kids movie" yet? What did you think?